This is a general description of how to install G-TEC Torch Boosters and Refuelers. Please read the Owner Manual that is included with with your G-TEC System for complete installation details. work on natural gas pipes. Do not install your system yourself unless you are qualified. Start with the right tools! - You will need a roll of Teflon sealant tape, 4 sizes of open end wrenches ( 9/16”, 5/8”,3/4” and 7/8”) and an adjustable wrench that opens at to least 1 1/4”. 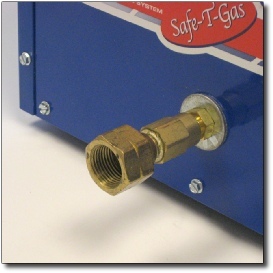 TB-15/30 Torch Boosters require a minimum 1/2” diameter low pressure gas supply pipe. TB-60, Refueler 60 and DM-60 require a minimum 3/4” diameter low pressure supply pipe. TB-125 requires a minimum 1” diameter low pressure supply pipe. Do not connect a Booster/Refueler to a pipe leg that has a heater, oven or other high volume gas consuming device sharing the pipe. Do not attempt this installation yourself unless you are qualified to work on natural gas pipes. 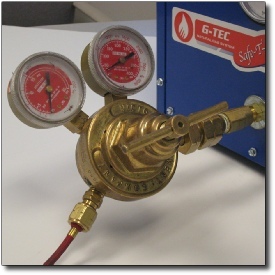 For most applications gas supply pressure should be between ¼ to 1 psi….some applications can support up to 5 psi gas supply but this should be discussed with G-TEC on a case by case basis. 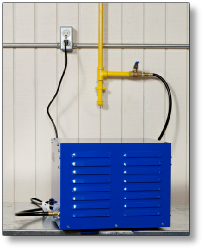 G-TEC includes a shutoff valve with each system, 1/2” for the TB-15/30 and 3/4” for the TB-60/125. Apply Teflon sealant tape to the thread on the male pipe end then tightly screw the shutoff valve onto the pipe. You may connect a torch directly to the Torch Booster and G-TEC provides an adapter that presents a “B” fitting to your torch hose. If you attach a torch directly to the Torch Booster be sure to install “Torch Mount” flashback arrestor check valves on the torch for safety. If you already own a regulator with a CGA 510 fitting (this is the same fitting that screws onto a propane BBQ tank) then you can use it with your Torch Booster. Your system includes a female CGA 510 fitting and adapter for connection to the Torch Booster. Be sure to install a “Regulator Mount” flashback arrestor on the regulator, or a “Torch Mount” flashback arrestor on your torch. You must use the hose supplied by G-TEC. Do not substitute any other hose, hard pipe or yellow flex hose. Safety equipment inside the Torch Booster is calibrated to the hose provided and anything else will cause the system to shut down without warning. You will need two wrenches for this step. Use a 9/16” wrench on the nut at the end of the hose for the TB-15/30/60 or ¾” wrench for the TB-125, and a 5/8” (TB-15/30/60) or 3/4” (TB-125) wrench on the nut attached to the cabinet. When tightening the fitting hold pressure on the cabinet nut so that it does not turn. Failure to support the nut on the cabinet will result in twisting the internal piping and void your warranty. Newer G-TEC systems have a lock fitting designed to prevent internal piping from twisting so the nut can be tightened with a single wrench. After the shutoff valve is connected to the supply pipe screw the adapter fitting into the ball valve. Be sure to use sealant tape for this fitting and tighten the adapter with a 7/8” open ended wrench. Next, screw the flexible hose onto the adapter with a 3/4” wrench. When installing the regulator on the Torch Booster use sealant tape on the high-pressure outlet fitting on the Torch Booster. Be sure to hold a wrench on the high pressure outlet fitting when screwing on the regulator to relieve pressure on the fitting. Failure to do so may result in twisting the internal piping and void the warranty. Newer G-TEC Torch Boosters have a lock fitting designed to prevent internal piping from twisting. Connect a “Regulator Mount” flashback arrestor check valve to the regulator. If you are connecting the Torch Booster to a pipe manifold put a B to NPT adapter on the end of the flashback arrestor check valve for connection to the pipe going to the jewelers’ torches. This adapter is not part of the Torch Booster system but can be ordered from G-TEC, or purchased locally. 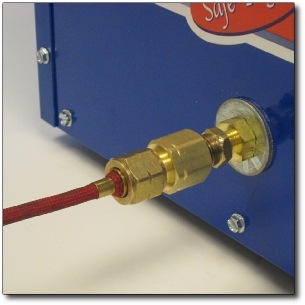 Your Refueler comes with a hose to connect to either single cylinder (left) or a G-TEC Manifold (right). 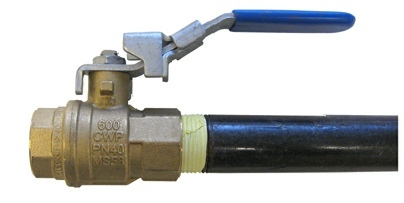 Cylinder valves are CGA 510 female fittings. As a safety feature G-TEC Torch Boosters and Refuelers must build up a minimum 22-25 psi before they will operate automatically. Turn on the ON switch then press START and hold it until the amber RESET light goes out. At this point the unit has built sufficient pressure to operate without further attention. 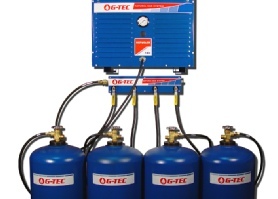 If the unit makes a clicking sound or seems to struggle to start STOP AND CALL G-TEC - 1-800-451-8294. TB-250 and TB-500 Torch Boosters and Refueler 180 Cylinder Filling Systems are hard piped to the low-pressure natural gas pipeline. There are two gas inlet fittings on the rear panel of the unit: the fitting on the left side is for gas supply pressure between 1 to 5 psi and the inlet fitting closer to the red/yellow cutoff switch is for gas pressure between ¼ to 1 psi. Whichever inlet fitting you connect to, cap the other fitting with a metal cap using Teflon sealant. If air gets into the Torch Booster/Refueler it will VOID THE WARRANTY and destroy the compressors. These units require a minimum 1 1/2” diameter supply pipe to come as close as possible to the point of connection before breaking down to a 3/4” pipe to connect to the inlet on the cabinet. The 3/4” pipe should be as short and with as few bends as possible. 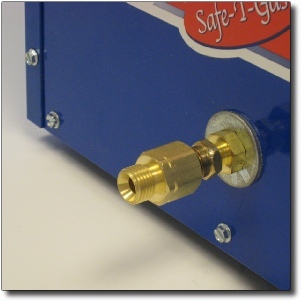 Electrical requirement for the Refueler 180 is 120 V 30 amp service. 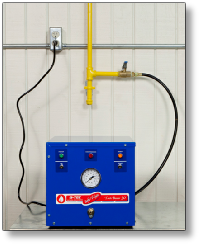 For the TB-250 and TB-500 Torch Boosters the electrical requirement is 208 single phase 30 amp and it is essential that power supply meet this parameter - measure your power supply when the Booster’s compressors are running to be sure. Voltage in excess of 220V or lower than 200V will cause high amperage, burning at wire connections and VOID THE WARRANTY. Some customers assume their power supply is 208V and don’t actually measure it until they start to experience shutdown problems. 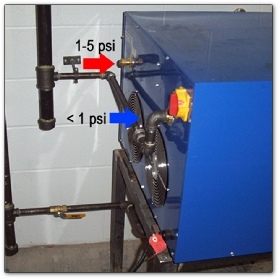 The gas supply pipe is connected to the low pressure inlet (¼ to 1 psi) in this photo. 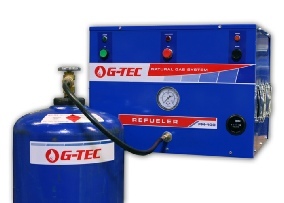 G-TEC Torch Boosters and Refuelers connect to a low pressure utility supply pipe with a flexible hose. G-TEC provides a shutoff valve at the utility gas pipe and the hose screws on to fittings at each end. Supply pipe diameter varies between 1/2” and 1” depending on Booster model and power requirement is 120 V 15 amp for all systems except TB-125 which is 120 V 20 amp.